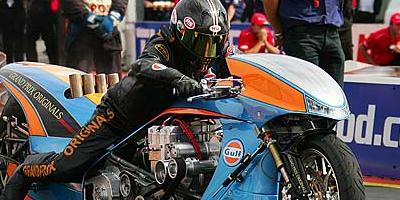 Despite heading the championship chase going into the final round of the 2011 European Top Fuel Bike Championship the Gulf Oil – Grand Prix Originals Top Fuel Bike team knew that their slender lead was probably not enough to ensure their sixth title. 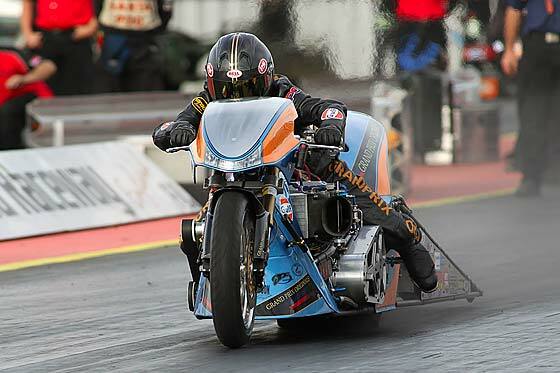 That proved indeed to be the case when the teams were presented with a tricky track surface following hasty track repairs on the start area at the UK’s Santa Pod raceway just prior to the event. The cream of European drag racing failing to get to grips with the freshly re-laid startline over the course of the weekend at what traditionally is the quickest track in Europe resulted in a heartfelt apology from UEM Commercial Rights holder Keith Bartlett at the post-race prize awards suggesting a fix will be a very high priority over the winter break. Despite the problematic track surface the team showed well in qualifying with an early shut off 6.25 secs @ 223.39 mph enough to secure second place behind class veteran Peter Svensson and set up a potential championship deciding final between two leading TFB teams in Europe. 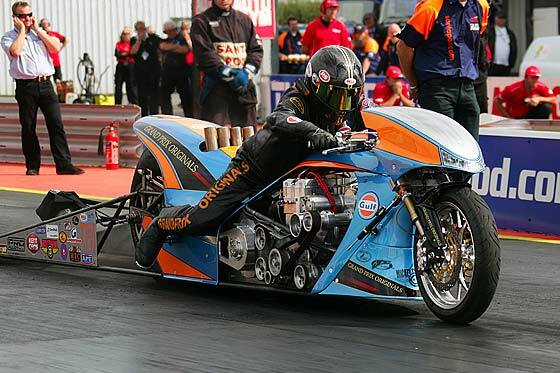 However, the track proved to be the Gulf Oil team’s nemesis when the bike overpowered the new track surface in the quarter final against Norway’s Sverre Dahl despite a very lazy clutch setup, handing the title to the standout Svensson team. Despite the disappointment of losing the chance for the title the team were happy with their great season showing to finish in third place on an all new bike. They exceeded all expectations and look forward to building on their great achievements in 2012. Schnitz Makes History, First Street Bike Six at 6.90!